At SuperCamps your children will be looked after by enthusiastic and experienced staff, all of whom have been carefully selected based on their experience, qualifications, character and attitude. Over 50% of our camp staff are fully or nearly qualified teachers and everyone employed receives an enhanced-DBS clearance and is reference-checked. All staff receive comprehensive in-house training to make sure they deliver to SuperCamps’ high standards. We encourage our excellent staff to return for future seasons and many do, offering their valuable experience as well as a familiar face to returning children. 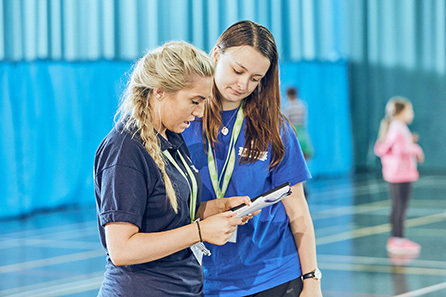 Each venue has a Camp Manager who will co-ordinate and manage their team whilst ensuring all programmes and activities running at their venue are fun, exciting and safe. There will always be at least one qualified first-aider at each venue. The Camp Manager will be contactable throughout the day if you need to change your pick-up plans or if you want to check that your child has settled in. Our camp staff are supported by Divisional Managers, who provide additional support and guidance should the need arise, and our Operations and Safeguarding teams provide logistical and specialist support from head office. Read more about our safeguarding and best practice.